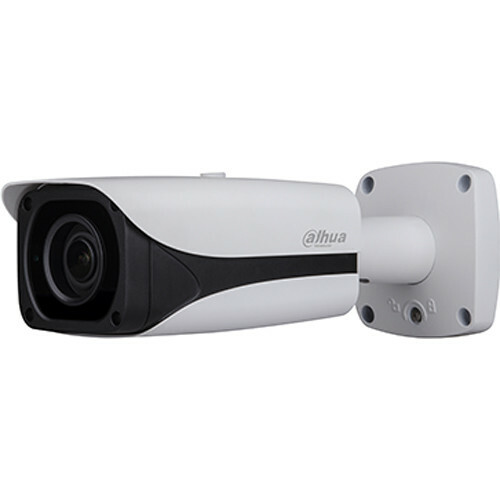 The Pro Series N25BB5Z 2MP Outdoor Network Bullet Camera with Night Vision from Dahua Technology uses a 1/2.8" progressive scan CMOS sensor to capture 1920 x 1080 resolution video at up to 60 fps. Four IR LEDs provide up to 164' of night vision. The 2.7-12mm motorized varifocal lens delivers a 97-34° horizontal field of view. Two-way audio communication is possible thanks to an audio I/O. An onboard memory card slot supports microSD cards up to 128GB (available separately). Integrated PoE technology simplifies connectivity by enabling the transfer of power and data through a single cable. This bullet camera is housed in an IP67-rated metal enclosure that is suitable for outdoor use. Box Dimensions (LxWxH) 14.5 x 7.0 x 6.9"